A review in 10 words (or thereabouts): A contemporary tale about life on the streets and the hope of a brighter future. Darren took the fall for Diamond Tony, the notorious head of the city's drug cartel. Two years later, Darren is finally out of juvie and determined to get even. Working as an informant for the police, Darren infiltrates Diamond Tony's operation. But falling for sweet, innocent Jessica was not part of that plan. She is a distraction and a liability. She is also everything Darren dreamed about while he was locked up, and with her, he has the promise of a fresh start. When a deadly turf war breaks out between Diamond Tony and the Bloods, Darren gets caught in the crossfire. The cops think he's playing both sides, and any mistake could be his last. Darren has to stay on his game if he's going to protect Jessica and if he is going to stay alive. 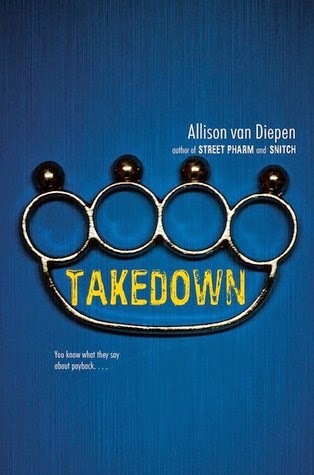 First, does carrying around a book with brass knuckles on the cover give you street cred? It's probably the closest I will ever get to brass knuckles. Now I'm fascinated, and I'm finding it difficult to stay focused :) Back to the review, Darren is a pretty amazing character. He's a young man who has learned from his mistakes. He's clean, working hard at school, and wants to make the streets safer for his little brother Kiki. What he's doing is dangerous, but he understands the consequences and holds his ground anyway. Darren is a pretty amazing role model (despite the fact that he's working for a drug kingpin). Sometimes Darren seemed a little too clean cut. I'm not sure how believable I found the story. The thing is, I could be completely wrong because I know very little of what happens in city neighborhoods filled with poverty and drugs. Darren dreams of becoming a music producer and van Diepen sprinkles rap lyrics throughout the book, but in the end, they have little to do with the outcome and do not enhance the book in any way. Darren's own inner-dialogue, outside of the lyrics, is much more interesting. Overall a fast-paced, engrossing book about a young man try to make a better life for himself. Darren is a likeable and sympathetic hero who you want to see succeed in his mission, hopefully in one piece. Reluctant readers will gravitate toward the book, and it's an excellent selection for teens who like urban lit.